operational standpoint as well as when it comes to addressing consumers’ needs and desires. (except on special occasions), according to Technomic’s 2018 Takeout & Off-Premise report. Indeed, says Technomic, consumers order food to-go (including pickup/takeout or delivery) from a restaurant an average of 5.5 times per month. Perhaps the biggest single category impacted by the takeout trend is beverage—from hot coffee, cocoa and tea to cold sodas and shakes. In fact, a full 62% of consumers say they are somewhat or very likely to order delivery from quick-service restaurant beverage concepts, and noncommercial operators stand to benefit as well. This growing opportunity means that selection of the right single-serve cup is a crucial decision. Operators need cups that keep hot drinks hot and cold drinks cold. Based on that consideration, some operators choose foam cups for their superior insulating qualities over paper cups—and they don’t require an extra sleeve. And best of all, newer iterations of foam cups are better for the environment. Focusing on socially responsible foodservice practices means that operators need to be mindful of sustainability and using environmentally friendly products—both on- and off-premise. Beyond that, customers care about the environment—and want the foodservice locations they visit to care about it, too. According to Technomic’s recent Generational report, 27% of consumers overall say they are more likely to visit restaurants that make an effort to be sustainable. This number is slightly higher with younger generations—31% of Gen Zers and 32% of millennials say so. But is commitment to the environment and sustainability possible without making a sacrifice in performance and the bottom line? Yes, says WinCup. 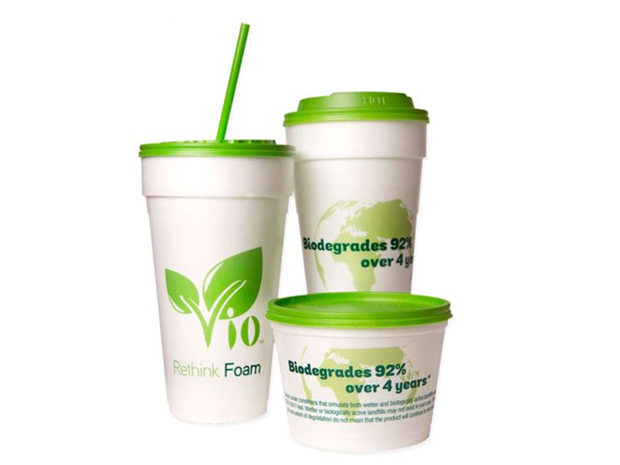 The company’s flagship eco-friendly product, Vio® biodegradable* foam cups and containers, are the first expandable polystyrene (EPS) foam products specially formulated to biodegrade 92% over 4 years. Vio also produces biodegradable lids and straws, allowing foodservice operators to enjoy a complete disposable product solution that’s environmentally sustainable. Making the switch from polyethylene-coated paperboard cups to Vio biodegradable foam can offer operators an array of benefits. EPS foam cups are lighter, so they are easier to store and handle during service. They provide all the superior temperature control you’ve come to expect from foam while being leak- and moisture-resistant. And, perhaps best of all, Vio cups are the lowest cost cup of all the green options. With takeout and delivery businesses, it is necessary to educate staff so they can communicate the earth-friendly facts to customers. Fortunately, Vio’s biodegradation claim is printed right on every cup and container. Additionally, staff can inform customers that the production of foam consumes less energy, creates less solid waste and uses less water than that of foodservice paper products. Choosing Vio biodegradable products lets operators focus on the quality of their food and drinks, and they can rest assured knowing Vio products have an eco-friendly end-of-life story that customers really go for. *Cups biodegrade 92% over 4 years, lids biodegrade 66.2% over 6.6 years, straws biodegrade 78.9% over 5.8 years. Tested under conditions that simulate both wetter and biologically active landfills using the ASTM D5511 test. Wetter or biologically active landfills may not exist in your area. The stated rate and extent of degradation do not mean that the product will continue to decompose.